Poor Samsung. Even as the embers of the memories of the disastrous Note 7 launch refuse to die, one or the other Samsung phone goes up in smoke, creating news and reigniting that dying flame. The latest news involves one of Samsung’s biggest phones, the Samsung Galaxy S8. The S8, launched last year, soon after the Note 7 failed, was the redemption phone for Samsung. 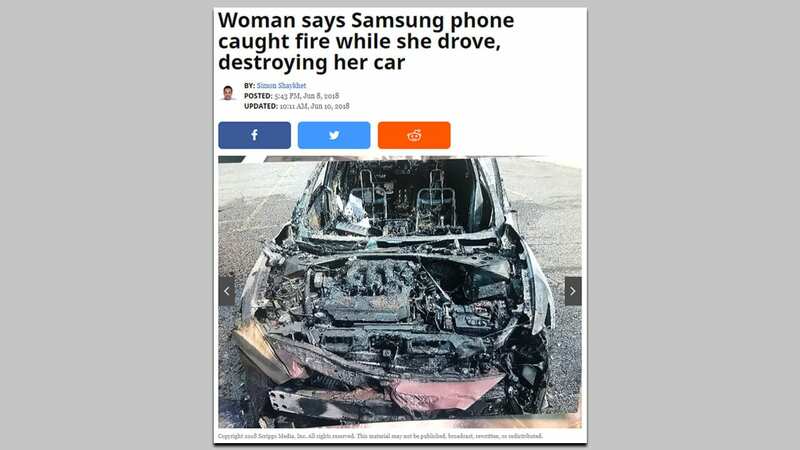 According to a report in WXYZ, a woman in Detroit, USA, is claiming that one of her Samsung phones, either a Galaxy S4 or a Galaxy S8, went up in flames, taking her car with it. Both phones were in the cupholder of her Nissan Maxima when she saw sparks and fire, reports WXYZ. The unnamed lady immediately stopped her car and got out. The subsequent fire destroyed her car. WXYZ says that they verified the lady’s claims with the Detroit Fire Department, who says that they contacted Samsung about the issue. According to the report, Samsung responded immediately and sent a crew to examine the phone and the vehicle. To be fair, since the Note 7 disaster, Samsung has gone to great lengths to ensure that its batteries are safe and that they won’t explode. Unlike the Note 7, which would spontaneously combust owing to a design defect, it’s quite possible that the phones themselves were safe, but the use of improper chargers or some external factor damaged the two phones. Investigators don’t yet know if the Galaxy S4 or the S8 was the cause of the fire.